People close to me know that I absolutely hate going to static events, such as a vehicle launch at a five star, or a wedding anywhere. I feel that both these events are a big waste of time, energy, and resources for everyone involved. Both are unnecessary extragavanzas serving no real purpose save for providing a misplaced sense of accomplishment to the hosts, while giving another opportunity to most thankless guests to later discuss, “food, like the hosts, was lukewarm.” Moreover, I just don’t see the point of any such spectacle, unless I get to bring its star attraction back home with me. But, sometimes, I don’t have a choice, and attendance becomes indispensable – for work, or for friendship. Or both. 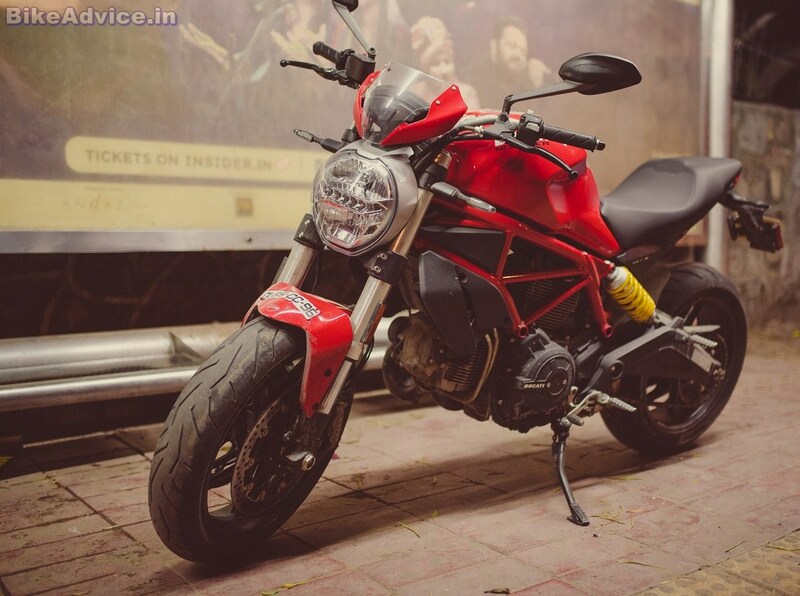 I faced such a dilemma recently, that too immediately after getting the bike home for this – the Ducati Monster 797 review. Apparently, I had completely forgotten about a close friend’s wedding, which I remembered only after seeing his name flashing in my cellphone. “You’re coming tomorrow, right?”, he asked. “Of course! Why do you even have to ask such a dumb question?”, I retorted. Sitting 200 kilometres away, he was perhaps not expecting such confidence in my tone, so he stood silent for a while, almost feeling momentarily guilty of doubting his friend’s intent. I loved it. Good thing is that he is not into reading bike reviews. So he would never know… Anyway, thinking over it very carefully, and also taking into account that my best photographer wasn’t available this time around (which meant that I would have to take pictures), I finally decided to go. It would also give me a fair idea of how the Monster would fare if a bit of touring is thrown in the mix. Lansdowne (read: “40 km of twisties”) is around 100 km from his place, so that helped too. Still, I could go only on one condition – if he could guarantee a fully secured parking space for the motorcycle. He assured me that I could drive a limo to his place, and no one would touch it. “Cool!”, I said, and quickly started the process of shoving the essentials in the backpack. Now my test bike was the 797+ that comes with a flyscreen and a rear seat cowl. It was an almost new motorcycle, but someone had still somehow managed to make one of the two Allen bolts, which hold the seat cowl in place, disappear. 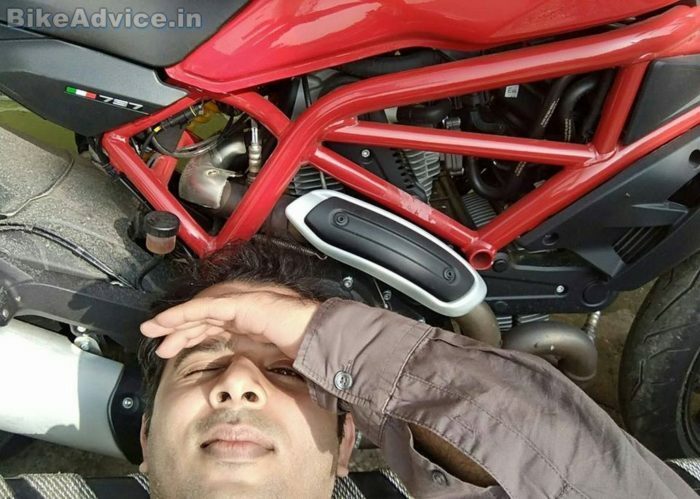 Although the Ducati official assured me that it won’t go anywhere, the thought of it flying away and causing a Final Destination kind of a catastrophe had me remove it in a jiffy. Plus, when it comes to clothing on a naked, lesser is always better, right? Just one Allen key from the tool kit below was enough to take the red cover off and reveal the pretty rear in its entirety. Tool kit packed and tucked away in its original position under the seat; a quick trip to the fuel station to fill the 16.5-litre fuel tank to the brim, and off I was, carving my way out through dense, but still moving, traffic of South East Delhi towards NH 24 during rush hour. Bad idea. 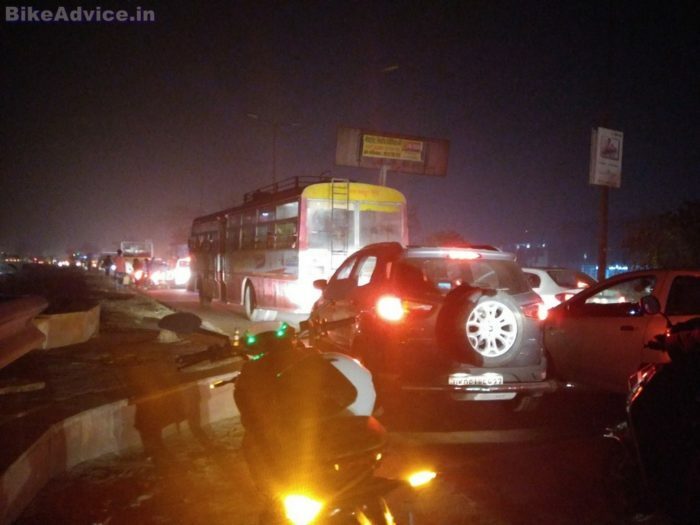 I must have covered just 12 to 15 km or less when I got this mother of all traffic jams where endless rows of vehicles resembled more like a huge parking lot than a jam on a national highway. Honestly, it looked more like those scenes from apocalypse movies where all traffic comes to a standstill before hundred feet high waves sweep all life on this planet into oblivion. I dismissed my hallucinations upon realizing that I was around Ghaziabad, and the nearest ocean was more than a thousand miles away. I parked the bike by the kerb; switched the parking lights on (rotate the ignition key anticlockwise a click further where it locks the steering); took the key out, and sat on the broken concrete fence alongside, with eyes locked on my steed. 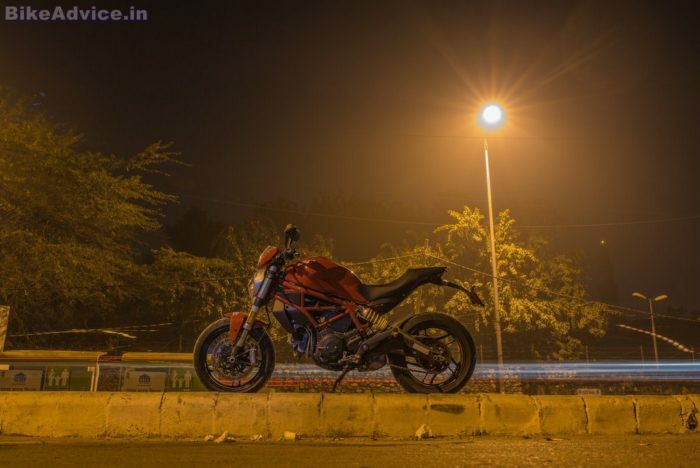 The Monster stood there nonchalantly, its red glistening even more with myriad hues of flashes bouncing off its rich texture, reiterating how beautiful the bikes are that wear the Ducati moniker. There are manufacturers who do their faired bikes right, and there are some who do their nakeds right; then there is the Ducati school of art that does every genre right. 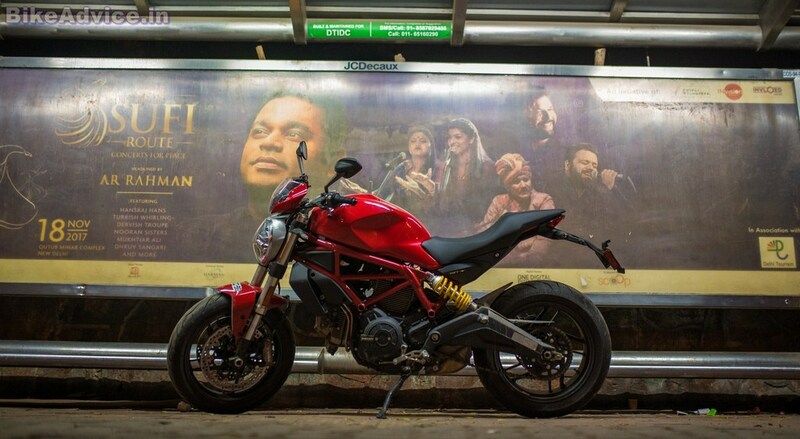 Heck, they even managed a looker, a Ronda Rousey kind of a looker though, in the Multistrada, in what is otherwise the ugliest category in the motorcycle world. 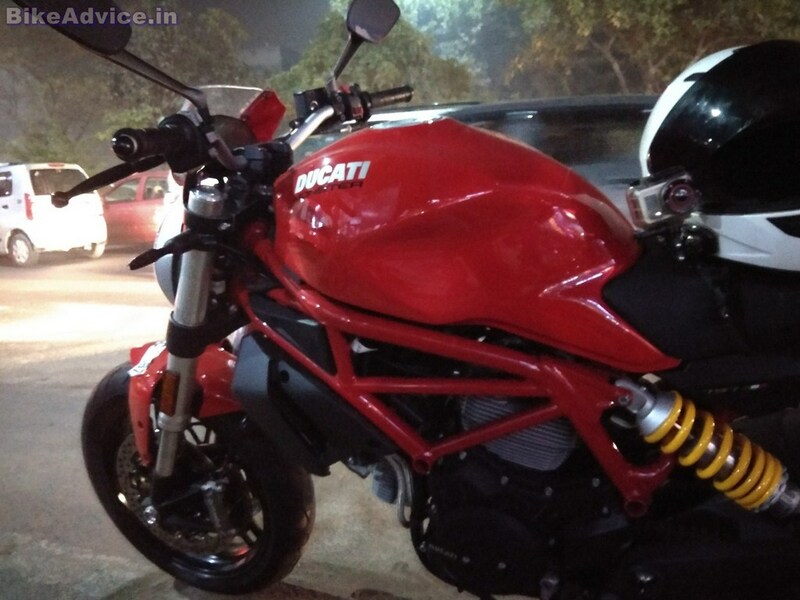 Therefore, it shouldn’t come as a surprise to you that the Monster is still the best looking motorcycle in its segment. Well, it has to be – it invented the segment. And it did that almost a quarter of a century ago! To be able to hold the crown for that long – now THAT’s astounding! It hits you even harder when you realize that the Monster’s design has always been minimalist in nature, but still always managed to look drool-worthy. Most other motorcycles that tried the same design philosophy – of packing just the essentials – have managed to look as interesting as my backpack. My ogling was interrupted by the sudden realization of covering 190 km in Uttar Pradesh, after dark. Now, I’ve done a lot more than that in the state in the past two decades, but since things have changed drastically post 19 March 2017, I had to exercise caution, despite not carrying anything that could be remotely proven as beef. So I got up and mounted the non-adjustable (unlike the Monster 821) 805 mm high saddle, turned the key, and slid the ignition switch all the way down to wake the Monster 797 up. 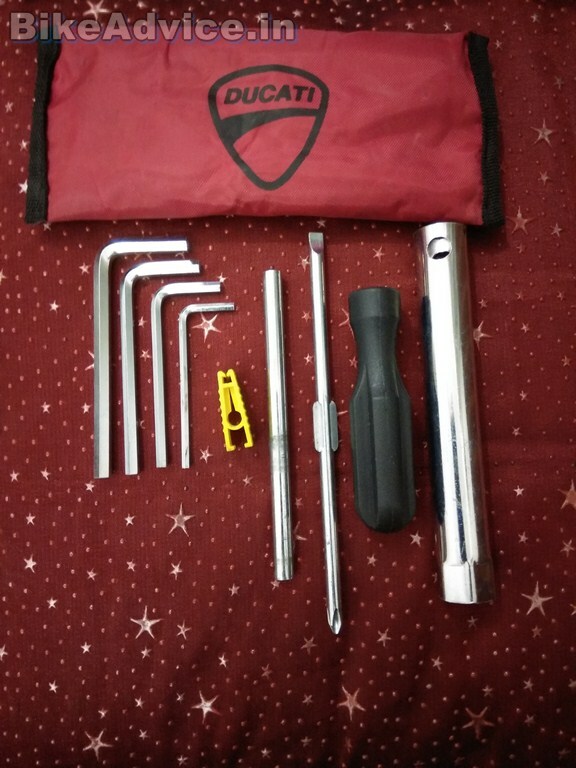 Now, regular readers would know how much I detest those unnecessarily loud exhaust systems, but this Ducati in stock form is way too silent for someone like me as well. It’s not a deal breaker though, because the more polished gentry would like it this way, while the nouveau riche would have gotten the loudest pipes out there anyway, even if the 797 was louder that it is right now. Still, you may check the video clip below to see if it’s in line with your tastes. The headlamp though is bright enough, which helped me quite a bit in finding an alternative route to bypass the aforementioned absolute stationary jam. This other route was not much better, but it at least got me moving. The 797’s clutch lever, unlike the Scrambler’s, has a soft-pull (thanks to the APTC clutch), which didn’t pump my forearm like most big bikes’ do in that kind of traffic, thereby keeping the ordeal from getting the better of my perseverance. It must have taken a total of around two hours for me to get out of that mess! The positive side is that it also allowed me to conclude that this Monster is one of those few big bikes which you won’t be apprehensive of riding during peak summers here in India. I was sweating inside my riding jacket, but the 797’s air- and oil-cooled engine kept its cool amazingly in what were the most trying conditions for a big bike’s engine. The only complaint I have is that this Monster’s turning circle is pathetic, making slow U-turns and parking-lot maneuvers tricky, especially for short riders like me. Taller riders can get around it by tilting the bike more, so again not a big deal for most. 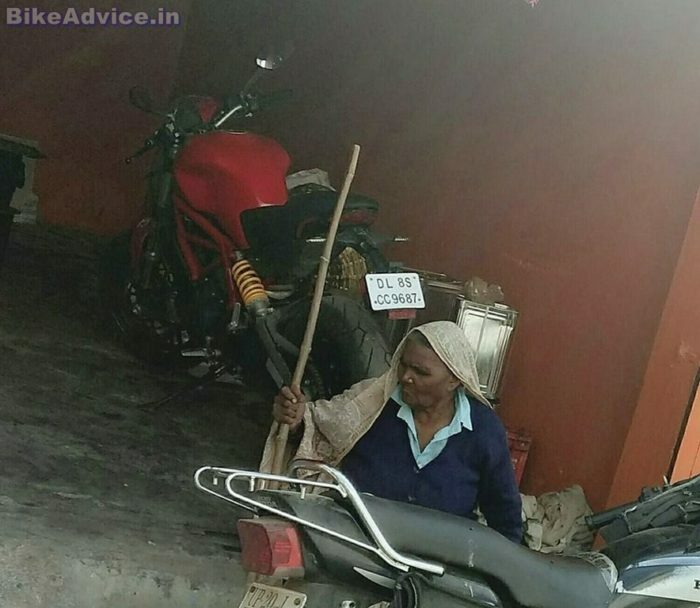 Here, let me also mention another irritant – this motorcycle does not want to get into neutral, and even when it does, the N glows green after a full second or two. It’s like that girlfriend who knows she is wrong, but won’t accept it immediately. I didn’t know bike had egos too. The gearbox is otherwise quite positive – the gears engaged smoothly, and false neutrals, if any, were a rider error. In fact, false neutrals, nine out of ten times on media units, are ALWAYS a rider error. Now you know what to think of a tester the next time he whines about too many false neutrals in his review. Anyway, I was finally out on the open highway with the 797 cruising comfortably between 90 and 120 km/h, with occasional bursts to 160 km/h whenever I was certain that a bovine, or a human with similar intellect, might not jump on to the middle of the road out of nowhere. The bike is supremely stable, and there are zero vibrations up until around 130 km/h, post which there is a faint buzz in the pegs that would go unnoticed by the majority of owners. Other than that, there are absolutely no vibrations anywhere else – handlebar, tank, and seat – on the bike! Tourers will be happy, but only after they get a better seat for this one, as the stock saddle of the Monster 797 is rubbish. It’s only good for around 100 kilometers, post which my derriere started to ache. 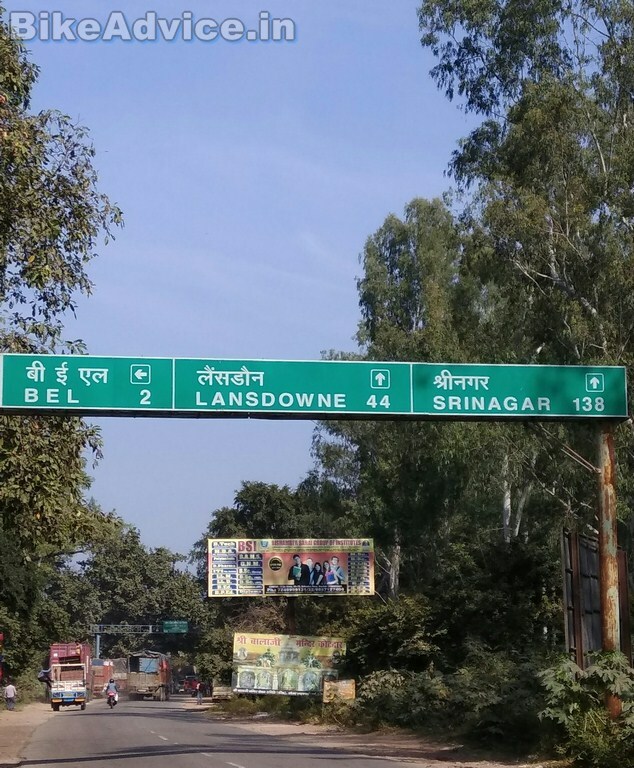 Thankfully, the next 100 kilometers were quickly devoured by the Monster, and I reached my friend’s place just in time to get piping hot Mughlai dinner, and multiple rounds of even hotter tea thereafter. Also, as assured, the Ducati did get Z+ security indeed. 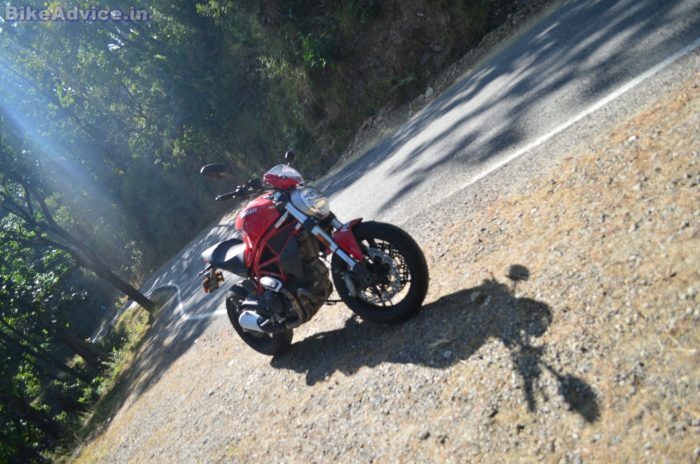 Next morning would be more special as I was supposed to ride down to Lansdowne and back. But, you know, there is something about small towns, their tranquility perhaps, that slows down the movement of time. As such, I was reveling in soaking sun after being treated to a sumptuous breakfast and, of course, an endless supply of caffeine. I would have synthesized more vitamin D in those couple of hours there than what we get in six months in Delhi. I surmised that we’re all solar powered, by varying degrees. Pun intended. I could finally push myself to gear up by around 12.30 pm, and headed straight to the fuel station as the low-fuel warning light had made its presence felt the night before. The 797’s instrument cluster does not have a range indicator or even a fuel gauge; just a low-fuel light telling you that you’re screwed if there is no fuel station in the vicinity. Well, it’s not that bad, really, as I remember one of the senior service guys at Ducati, in 2015, telling me that the Scrambler holds around four liters in reserve. The Monster 797 holds more, from my calculation, as the bike never took even 10 liters of fuel at the filling station between two consecutive low-fuel lights – it always hovered around 9-9.5 liters. The light came on around every two hundred kilometers, which means the fuel-efficiency remained an amazing 21-22 km/l for the entire 702 km roadtrip comprising all kinds of possible conditions and terrains that a prospective owner would experience in India. I just checked my card bill, which shows that I started from the fuel station for Lansdowne at exact 1 pm, and I had to be back by five to avoid my friend from fuming on his D-Day. “Will have to gun it,” I said to myself, letting the clutch out and wringing the throttle a bit too much subconsciously. The rear spun wildly, kicking up a storm of dust dissuading the locals behind me from approaching the Monster for a selfie. The Rosso II found traction eventually and rocketed me off everyone’s view in what seemed like three seconds. See, the Monster 797’s 803 cc engine might make 73 hp only, but, when you do not have traction control, that’s more than enough to get you in trouble real fast. And that’s exactly how I like my motorcycles – undiluted, raw, where the rider, not a computer chip, takes full responsibility for his wins and losses. Unlike the previous day, where I could only start post dusk, I now had visibility by my side. Therefore, I made full use of it in covering as much ground as I could quickly, but safely. Boosting my confidence were the stupendous brakes of the 797. This might be the entry-level Monster, but Ducati, unlike ALL its competitors, haven’t compromised a bit when it comes to hardware. The Monster 797 gets the same M4.32 Brembos as the Monster 821, and keen readers would remember that I had found them to be superlative, in both feel and bite. That’s how a fast bike’s brakes should be, and this is one area, other than design, that the Japanese can learn from Ducati. I repeat – none of the 797’s competition has brakes like these! Heck, not even some of the liter-class bikes come with such phenomenal brakes! Regular readers would also know that I have always maintained that a) your brakes are as good, or as bad, as the grip provided by your tyres, and b) the tyre grip, in bikes with ABS, can be easily ascertained by how late or early the ABS kicks in. I am happy to report that the front tyre grips the road so adhesively that the 797 always comes to a super-quick halt without summoning the ABS. I deliberately tried locking the wheels on a loose surface to test if the ABS was actually working! It was, of course. 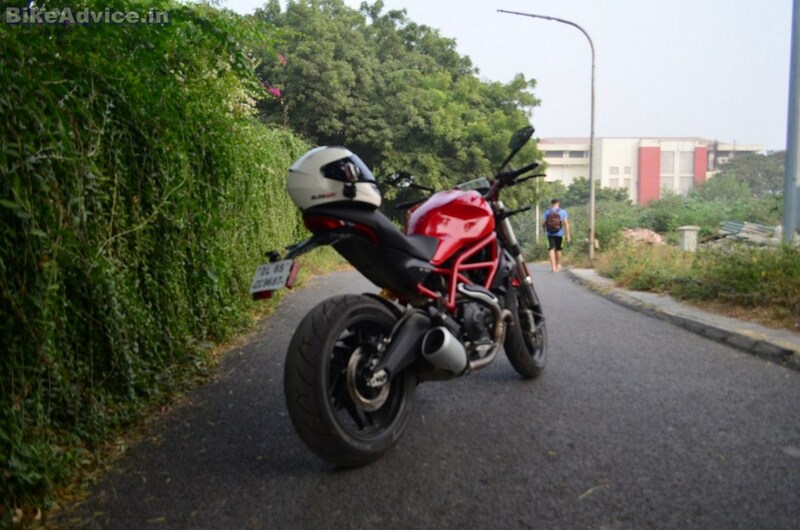 Complementing the fantastic rubber and brakes is the Monster’s fork, which, at 43 mm, is the beefiest in segment. The 797’s arch rivals make do with 41 mm units. The result? Class-leading front-end stability and poise. The sheer feeling of solidity provided by fat forks in some motorcycles is something that I absolutely love, because they make the bike feel as reassuring in the corners as it does on the straights. The Monster 797 is one of the finest examples of that. And it’s not just the front-end; the whole motorcycle feels so taut like it was put together not in parts, but rather carved from a single block of some hardened alloy. I say alloy because the bike feels light; strong and tight, but light. You may check the Ducati website to see how much it weighs; here I will just tell you how it feels. I just realized that I have repeated the word ‘feel’ six times in the last seven lines, and am not ashamed one bit as motorcycling, I feel, is all about that one word – FEEL. So that’s eight times now in as many lines. The best part of the Monster 797, along with its handling, has to be the meaty mid-range. The motor produces 67 Nm at just 5,750 rpm, whereas its closest competitor produces its peak torque at way over ten thousand revs! That essentially meant I could decimate the uphill section in 3rd and 4th gears, whereas most other bikes have to manage it in the first three cogs. That also translates to brilliant overtaking ability on the highways along with stress-free commutes (read: “fewer gear changes”) in city traffic. Moreover, this, by far, is the smoothest Ducati I have tested yet. 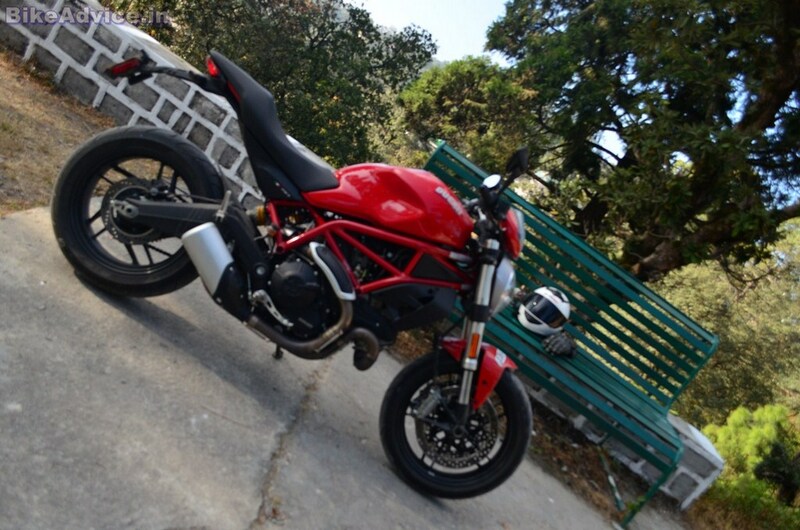 The fueling is near-perfect, and it doesn’t have that drive-chain clatter too – a typical Ducati trait, I hear. Okay, the Scrambler didn’t have it. The Diavel and 821 did. I had last visited Lansdowne in 2007, when it was not as famous as it is right now, and the roads back then were almost spotless. This time around the roads were broken at many places, and no, I am not referring to the landslide affected sections. You may check the impromptu video review and see it for yourself. You might have noticed already how the 797 behaved on rough roads, but in case you didn’t, I shall tell you about it right away. See, if you’re a lighter rider like me (read: “less than 60 kg”) you’ll find all Ducatis, including the 797, to be a bit on the stiffer side on factory suspension settings. But it’s not disconcerting, and I didn’t face any issues over broken surfaces. The first inch or two of the compression stroke is soft, and then it gets progressively firmer. Therefore, don’t fret, you won’t get thrown off the bike upon suddenly encountering sharp inconsistencies in road surface. 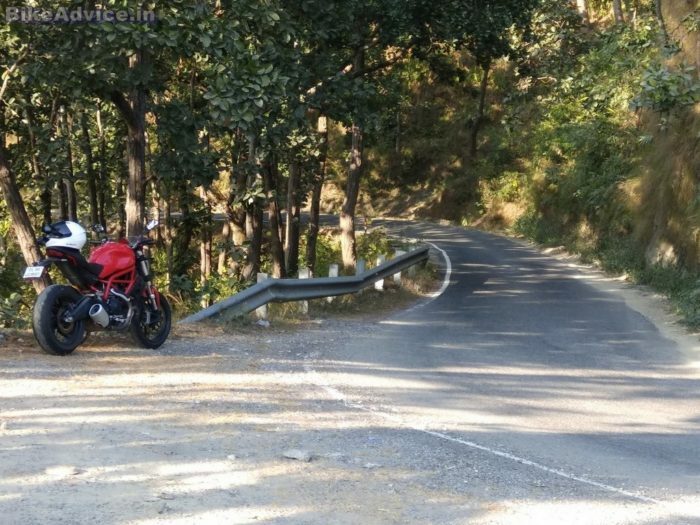 In fact, this trait, coupled to the ample ground clearance, makes it one of those few big bikes you won’t mind taking on bad roads at a fair clip. That also makes it the only motorcycle in its segment that would never scrape its underside over speed-humps. Heavier riders might find the stock suspension tune to be perfect. And if they don’t, they would be able to find the sweet spot as the monoshock allows preload and rebound adjustment. I didn’t touch it, as the damping was in line with my preference. 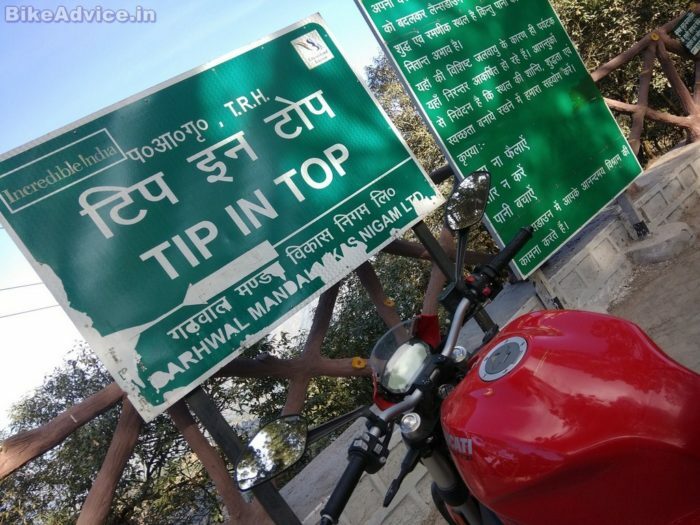 Time was favouring me too, as it was 3 pm and I had just made it to what is perhaps the highest point in Lansdowne. I clicked this picture and started to head back, as I had a wedding to attend. But as soon as I got out of the parking lot, I was stopped by five, pretty, young girls who were looking for the coordinates of some place in Lansdowne that I had never heard of. 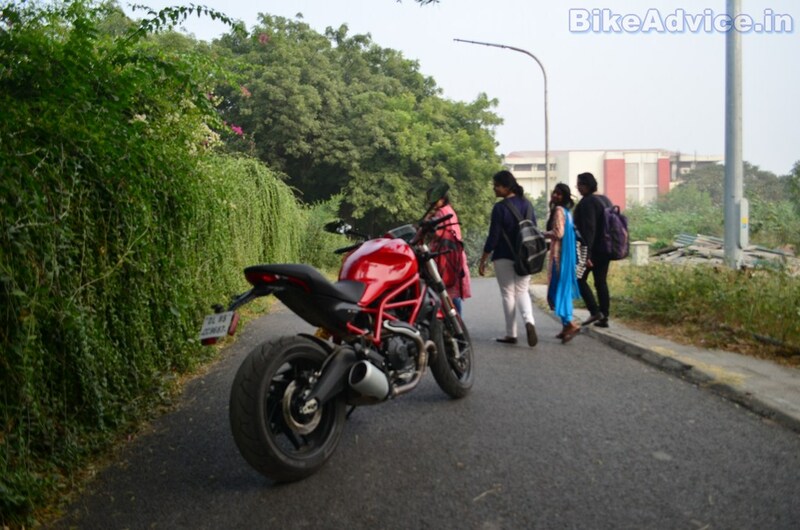 I took their leave after suggesting them to contact the forces’ personnel (Lansdowne is a cantonment area), but couldn’t help thinking that the girls did indeed find the Ducati guy unintimidating and approachable. Romeos may take note. I again had 40 km of twisties waiting for me, so without wasting any further time in psychoanalysis, I went for them. The twisties, I mean. The Monster 797 was descending faster than everyone else on the road, putting a wide grin on my face all throughout. And that’s the beauty of this motorcycle – it’s powerful enough to excite, but not bonkers enough to scare you every time you twist the throttle. It’s not a demanding motorcycle to ride fast; it doesn’t drain you out. That is why I wasn’t tired at all after concluding my 200 km ride by exact 5 pm. The lack of fatigue stamps the fact that on the Monster 797 you are concentrating on having fun, and not on keeping the bike from trying to kill you at the first opportunity. A ‘friendly Monster’ would be an oxymoron, but that would be the best way to describe the 797. It will entertain you no end, but won’t ever stare at you contemptuously. It’s forgiving without being dull; it’s exciting without being scary. And that’s a rare combination, if you ask me.